Cities cover only about 3% of the Earth’s land but, are responsible for 70% of the world’s energy consumption and 75% of the carbon dioxide emissions that contribute to climate change. So, it’s no wonder designers and engineers are racing to come up with all kinds of air-purifying solutions, from smog-sucking towers and bikes to moss-covered walls. 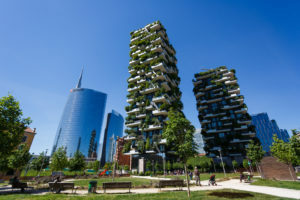 But one of the most impressive ideas yet are “vertical forests”, realised in 2014 by Italian architect Stefano Boeri in Milan, where two towers with over 100 apartments between them host nearly 500 medium and large trees, 300 small trees, 5,000 shrubs and 11,000 plants. The science is simple: Trees are the cheapest and most efficient way to absorb carbon dioxide. The 20,000 trees and plants across this pair of towers can transform approximately 44,000 pounds of carbon dioxide into oxygen each year. 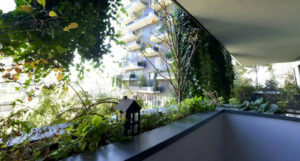 Trees, a perennial gift from nature, can also keep temperatures cool indoors and filter out fine dust particles and noise pollution from traffic below. The logistics of making it all happen, however, was a lot more complex. The process began with bringing together experts in structural engineering and botany to answer all the essential questions. For example: How can a tree resist extremely windy conditions at 400 feet in the air? Engineers then had to devise a way to secure the roots of the plants in their containers while making sure they could be properly watered and fertilized. Laura Gatti, an architectural botanist on the project, also conducted a three-year study about local plants to determine which species would survive the conditions of the towers. And, of course, even after they’ve been planted, the trees need regular maintenance. That’s done by a team of aerial arborists, who, like the familiar skyscraper window washers, make their way up and down the buildings, inspecting and grooming the vegetation. 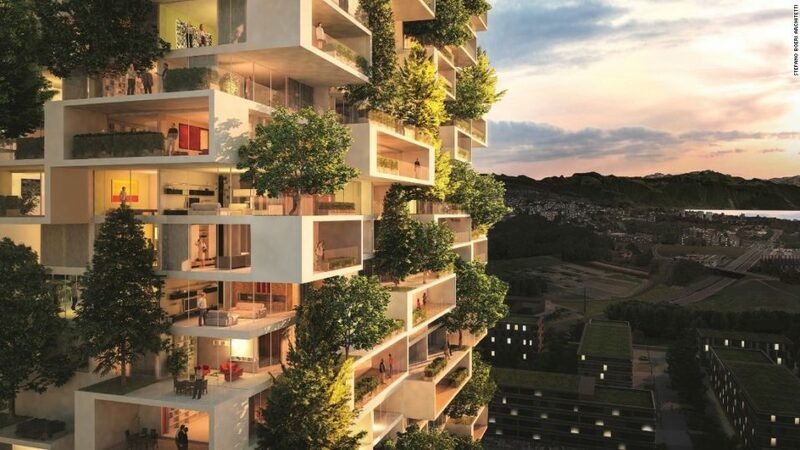 As cities continue to grapple with air pollution, housing shortages, and climate change, these vertical forests could very well be part of the overall solution. And you can certainly expect to see more of them.